I get the Quilt of the Month email from the International Quilt Study Center. 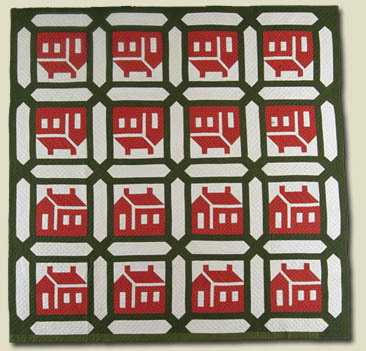 Some quilts are old, made by unknown stitchers, others are by renown contemporary quilt artists. This one is from January, and appeals to me since I have houses on the brain. 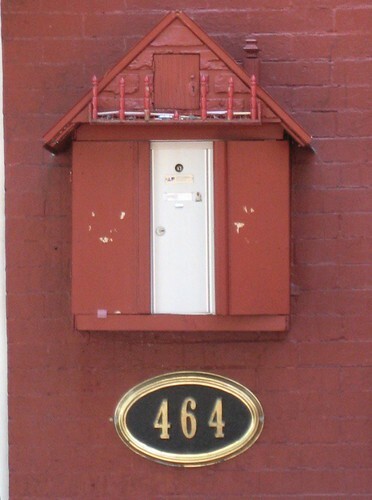 Reminds me of this mailbox I saw in Sunset Park while apartment hunting. This entry was posted on Wednesday, September 5th, 2007 at 12:51 pm	and is filed under sewing, web. You can follow any responses to this entry through the RSS 2.0 feed. You can leave a response, or trackback from your own site. Sounds like there might be an interesting story behind the placement of those items. tee hee…wish you would’ve photographed those things, except you probably weren’t in the mood …. can’t wait to see your new place and new neighborhood! !